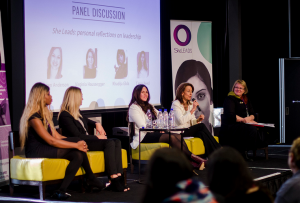 The She Leads Conference brings emerging and established women leaders, including female-identifying and non-binary people, together with some of Australia’s most inspiring, diverse and accomplished women leaders. The Conference is YWCA Canberra’s premier event, held annually in Canberra. Now in its fifth year, we have built a community of more than 830 women to develop their leadership identity, share their experiences, and explore the impact of gender on our family, community, and work lives. Subscribe to the monthly She Leads Newsletter to receive updates on all She Leads events and opportunities. 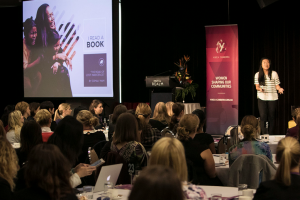 The 2018 She Leads Conference was held at the Rex Hotel on 1 August and showcased a diverse range of women’s stories, often against adversity and discrimination, and how they have used their position to encourage and lift women around them. Throughout a full day of speakers and workshops, we explored the theme of Rise which focused on how women grow powerful by acknowledging individual successes and building up the collective. This theme was continuously emphasised throughout the day by each of the equally uplifting speakers and panellists who reiterated the importance of women supporting women across all platforms and stages of life. Attendees were able to critically engage with key concepts surrounding acknowledging their own hard work and not simply dismissing it as luck, what it takes to be a good leader and the importance of not only receiving however providing mentorship to other women. The Conference was emceed by Meschel Laurie and keynote speakers included Jamila Rizvi, Nas Campanella and Mary Delahunty. Panel discussions centred on two different concepts ‘Leading and Lifting’ and ‘Creating structural change to rise’. Our panellists included, Dr Vanessa Lee, Natalie Walker, Bridget Clinch, Dr Raji Ambikairajah, Professor Marian Sawer, Dr Jessa Rogers and Corporal Laura Power. Our panel facilitators were Angela Priestley and Michele Fonseca. Attendees rated the Conference highly, with 100 per cent of attendees rating it as ‘Excellent’ or ‘Good’ and 89 per cent of respondents indicating that they would attend the Conference next year. Furthermore, 98 percent stated that they were likely to recommend the Conference to other women. She Leads Conference 2018 was hands-down, the best conference I have ever been to. It takes a lot for me to step away from the office for the day, but this conference was totally worth it. Every speaker was top-notch, the program was perfectly curated and heck, there was salmon for lunch! Congratulations to all involved. Loved hearing from such a diverse range of women and how different each one was. I loved the informal, fun but also serious nature of the Conference. Lots of laughs but also shared journeys and experiences with a view to ‘lift up’ women. I was so engaged and glad to hear from wonderful women who are actively doing, learning and disrupting the culture of work and leadership we inherited. Women’s Agenda wrote several articles on this year’s conference, here is one on Nas Campenella. The 2017 She Leads Conference was held on Thursday 1 June at QT Hotel, and also included a Cocktail and Networking Function held the night prior at Lucky’s. Despite all the gains women have made in obtaining formal leadership positions, the reality for many Australian women is that they are still locked out of decision making and leadership roles. Further, the significant leadership contributions by women within their family and community are often unrecognised and undervalued. This ideology formed the theme for the Conference: Challenge. The theme was woven through keynote and panel discussions, and saw attendees discover and discuss all the challenges they face in everyday life, and potential solutions. 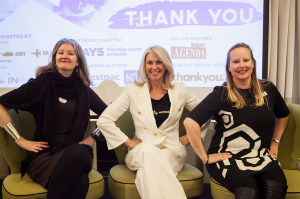 The Conference was emceed by Tracey Spicer, and keynote speakers included Clementine Ford, Michelle Deshong, Nakkiah Lui, and Drisana Levitzke-Gray. Panel discussions centred on two different concepts of challenge; Challenging the System and The Challenge of Changing Gears. Panellists included Shen Narayanasamy, Elise Burgess, Christine Castley, Alex Sloan, Captain Stephanie Steel, Myfanwy Galloway, and Summer Edwards, and panel facilitator were Caterina Giorgi and Angela Preistley. Attendees rated the Conference highly, with 92 per cent rating the Conference as ‘Excellent’ or ‘Good’, 91 precent stating they would recommend the Conference to other women, and 84 per cent of respondents indicated that they would attend the Conference next year. The diversity of voices was great. I was really impressed with the way the conference was run and the high calibre of speakers. Don’t change a thing – brilliant! The quality of speakers was OUTSTANDING. 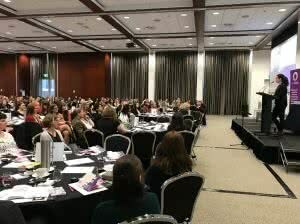 One of the primary goals of the 2016 She Leads Conference was to continue to build on the success of previous Conferences, and raise its profile on Canberra’s annual professional development calendar for Canberra women. new contacts that they can learn and share knowledge with. The theme for the 2016 Conference was Transform, which was intertwined through all aspects of the event, including keynote speeches, networking opportunities, workshops, panels, and masterclasses. The Conference was emceed by Jane Caro, and keynote speakers included Marita Cheng, Indira Naidoo, Captain Jenny Daetz, and Lucy Perry. Panellists included Renee Carr, Carly Findlay, Kerrie Tim, Yen Eriksen, Amber Beavis, Tanya Dannock, Jeanette Purkis, Amanda Whitley, Philippa Moss, and Rita Joyan, and were facilitated by Caterina Giorgi, Ginger Gorman, and Zoya Patel. Breakout workshops were facilitated by Suzi Skinner, Heather Reid, and Rita Joyan. Attendees rated the 2016 Conference highly with 99.5 per cent rating the Conference as ‘excellent’ or ‘good’, 97 per cent stating they would recommend the Conference to other women, and 95 per cent of respondents indicated that as a result of the Conference they felt more motivated to pursue their leadership goals. What a fabulous unique event for women. Thank you! There were real strategies that will be easy to bring back to my workplace. Looking at leading in many aspects of life and how to get the best results. The theme for the 2015 Conference was Discover. Connect. Ignite. based on the YWCA Canberra vision of Women achieving their potential. The Conference was an intergenerational event, and women of all ages and at all stages of their leadership journey attended. The event combined education and skills development, an abundance of networking opportunities, and a mix of stimulating talks and workshops with some of Australia’s most renowned women leaders. The event theme was Discover, Connect, Ignite. 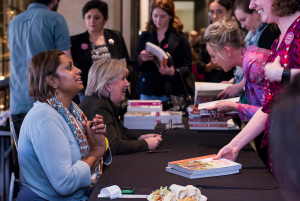 The Emcee for the Conference was Tracey Spicer, and Keynote speakers included Stephanie Lorenzo, Yamini Naidu, Clare Bowditch, and Professor Gillian Triggs. Panellists included Kate Carnell AO, Nipuni Wijewickrema, Emma Bennison, Tjanara Goreng Goreng, Rebecca Skinner, Dai Le, Hala Batainah, Stephanie Foster, and Jessica May. Masterclasses were run by Jacqueline Jago, Dr Sarah Pearson, and Angela Priestley. Attendees rated the Conference highly, with 98 per cent of evaluation respondents rating the conference overall as ‘excellent’ or ‘good’, and 93 per cent stating that they would recommend the Conference to other women. I loved it. Thanks for this great, empowering, networking opportunity. What a wonderful selection of speakers who spoke from their heart and shared honest and personal stories. I feel privileged to have been able to share their stories with them. I look forward to attending next year and hopefully the master classes too. I will definitely recommend this conference to my colleagues. I would love to keep She Leads in this price range for students – there is nothing of its kind and leadership and empowerment should be inclusive not exclusive. The 2014 Conference was the first She Leads Conference, and pulled together a diverse and inspiring line-up of women leaders from numerous industries to empower and motivate the 170 delegates in attendance. The Conference provided women leaders and those aspiring to leadership with the opportunity to develop the skills, knowledge and networks to accelerate their leadership journey, and focused on the theme Learning, Collaboration, Leadership. The day was emceed by Susan Brennan and featured a keynote speech by Anne Summers. Panellists included Khadija Gbla, Casey Keed, Lauren Anderson, Virginia Haussegger, Carmel McGregor, Yolanda Vega, Helen Conway, and Caroline Lambert. Workshops were facilitated by Suzi Skinner, Di van Meegen, and Julie McKay. Attendees rated the Conference highly, with 98 per cent of evaluation respondents rating the conference overall as ‘excellent’ or ‘good’, and 96 per cent stating that they would recommend the Conference to other women. Hearing the panel members speak about their different leadership experiences was very inspiring and unique. The conference is a great way to network (connect and reconnect) with other women who want to achieve a common goal. I felt empowered to be in a room full of strong women promoting leadership and awareness. Leadership is a complex notion and coming to conferences like this open your eyes to new things as well as reaffirm what you already know – and puts it front of mind. I can’t praise the She Leads Conference enough! It had the perfect mix between leadership theory and discussion about how being a woman affects leadership style and capability. Thank you! My expectations were well and truly met and exceeded. I’m leaving with many things to think about that will help me better understand myself and grow. This has given me inspiration and encouragement to be strong and go for what I want to achieve.